If you would like to make a major change to the appearance and feel of your kitchen, you may be tempted to replace the units and appliances in their entirety, totally remodel the layout or even extend or change the location of your kitchen completely. All of these options often involve a great deal of time, money and personal investment, and also constitute a fairly major risk – they are each big undertakings that could heavily disappoint if they go wrong in any way, and would cost still more to put right. However, you may be surprised to find out that a tangible difference can be achieved through a method that is far less expensive, time-consuming and stressful. You can give the impression of a total kitchen makeover simply by changing doors! Read on for a few top tips from The Kitchen Warehouse on how to make the absolute most of a few new kitchen doors, creating results that you and your family will love. In most kitchens, the doors act as the full facade for each unit, with the everything else hidden beneath a countertop, positioned side by side so it can’t be seen, or pushed up against the walls of the room. It’s often a different case for island units, but the doors on these still tend to suffer more wear and tear than the body of the unit itself. By removing these and adding replacement kitchen doors, your units and cupboards will feel brand new again. Of course, you have a choice between buying new doors to match the body of your kitchen units, buying unfinished doors and painting the two the same colour, or opting for a complete contrast. 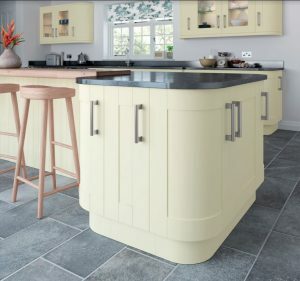 This latter option can go a long way towards making your kitchen look like an entirely different space, as choosing bolder colours for one or two doors and leaving the rest a more “natural” shade – or one that blends in with the rest of the décor – will allow you to manipulate focal points and sightlines, drawing visitors’ attention to, say, your beautiful oven, an elegant display of kitchenware or even an artwork or your kitchen accessories. Including doors with glass panels can add a little interest to a bare looking row of overhead units, and will allow you to display your finest crockery and kitchenware as part of the overall design. Glass also helps to give a space depth and makes it look larger. If you wish to bring your kitchen up to date, the finish you choose can make a great deal of difference. For a sense of simple elegance and clear contrast, matte looks are an increasingly popular option. At the other end of the spectrum, however, high gloss is still very much in demand and provides an attractive reflective sheen that is easy to clean and will also give the room the impression of being larger. Drawer fronts get tatty and rickety very quickly, simply due to their means of operation. If you’re hoping to give your kitchen an upgrade, it’s definitely worth remembering to replace these. As well as replacing your cupboard doors if they’re also looking a little worse for wear, it may be worth looking into purchasing some additional cabinet doors to improve the overall look of the room. To improve the flow of their room’s design, many homeowners now choose to disguise their fridge, dishwasher and other appliances behind cabinet doors, so this is another technique to look into. Handles – Yes or No? The colour and finish of your replacement kitchen doors are not the only aspects you should consider, of course. If you’d like to further increase the sense of flow within the space, perhaps a good idea would be to do away with clunky cupboard and drawer handles that break up otherwise smooth lines. A great deal of modern kitchen design involves hidden handles, meaning that the ease with which you can open or close doors is not impeded, but everything looks a great deal smoother and simpler. There’s a great deal you can achieve by replacing your kitchen doors that isn’t simply visual. You’ll often need to get hold of new hinges when you purchase a new door, so why not make the most of the opportunity and invest in some soft-close hinges, a great alternative to the traditional type of the product. These wonderful little feats of engineering mean that doors can be made safer for visitors of all ages, their operation becomes more elegant and wear and tear is vastly reduced as they will be much harder to force or slam. They are extremely easy to affix and will last for years. If you’re going to the effort of refurbishing your kitchen, it’s very important to search for high-quality products that will last for years. You’ll also need to take your time and make sure you look at every replacement kitchen cupboard doors option “in the flesh” to be sure that it suits your vision. The best idea is to visit showrooms with a clear idea in your mind of what you wish to achieve and to discuss everything in depth with the specialists you meet there. You can visit the Kitchen Warehouse’s showroom at Hutton Moor Farm, Hutton Conyers, Ripon, North Yorkshire, HG4 5LZ, between 9am and 6pm from Monday to Friday, and from 10am to 3.30pm on Saturdays. Our experts will be on hand to respond to any questions you may have. The replacement kitchen cabinet doors we sell can be made to measure – plus Kitchen Warehouse can also provide entire brand new kitchen units and accessories to match.